Ok, so I know I have been blogging about embarking on the wonderful journey of explaining money and budgeting to my kids. Well, turns out, it isn’t as easy as I thought it would be. It Is so hard to teach kids about budgeting when they have a very, very simplistic view of money. Before you roll your eyes and say ‘I told you so!’, let me just say that I haven’t given up on this project. In fact, I enlisted the help of my mommy friends (who also happen to be Psychology majors) to give me some tips and ideas about how to do this without breaking my brain. Here is what I have come up with: THE PIGGY BANK SAGA. Ok, I know. You are probably saying ‘but the piggy bank is old news’. Well, there is a lot of value in things that have lasted decades, and this little object is one such thing. 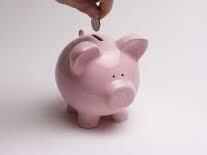 Piggy bank (sometimes penny bank or money box) is the traditional name of a coin accumulation and storage receptacle; it is most often, but not exclusively, used by children. Here is a picture of a piggy bank (c’mon, humor me here). Ok, so here is the idea. 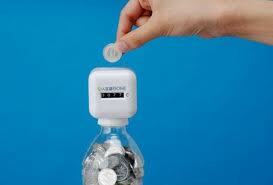 Take the generic piggy bank and have one for saving, spending, and donating. First of course, you need to define the terms. I use the most simplistic explanations so I would say something like saving is when we keep the money so that we will have enough to buy ‘x’ item. Thankfully my son and daughter know the word ‘buy’ so I don’t need to explain that term anymore. Donating would be giving and spending is using the money to buy ‘x,y,z’ items. Or something along those lines, you get my drift. I am thinking, and my mommy-psych major friends agree with me, that this will teach the kids the following things without the trauma of deprivation. One, it will give them the idea that there are different actions connected to money. 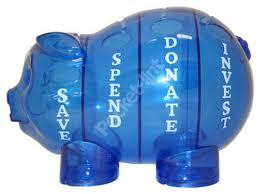 The general idea behind saving, spending, and donating. The value of waiting for something. The value of effort for something desired. It does not really matter what you use, as long as you get the point of the exercise across. Now, you also don’t have to go out and buy any kind of money saving vessel. You can use any old jar, tin, or container. A lot of my friends save the pretty seasonal tins for tea and use those for odds and ends. That would be perfect for this project. Similarly, you can use any mayo jar or cheese spread jar, create a slot for the coins and bills, and you have your pot! 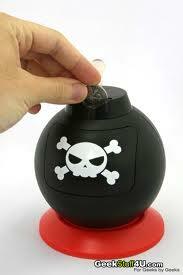 A suggestion to get the kids excited is to have them decorate their piggy banks. I know the idea of arts and crafts really gets my kinds excited and quite dedicated. So, I hope you see some merit in this simple money-saving lesson plan. Do your kids have a piggy bank? What do you think of using multiple banks for different purposes?